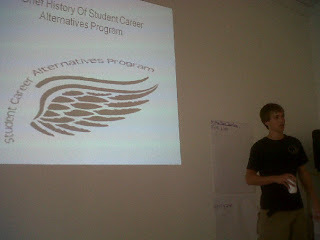 On Wednesday July 29th Student Career Alternatives Program(SCAP) had a had a meeting to develop a 2010/2011 action plan and timeline. We started with a brief history of the organizations past actions and accomplishments which included leading a campaign to close a publicly funded marine corps themed high school before it opened, having a presence at numerous high school career days, providing workshops and info sharing sessions to high school students, facilitating a city wide art contest, and playing an important role in introducing several pieces of legislation in the Georgia Senate and the House in the 2010 session. Christina Repoley took on the task of facilitating the meeting, keeping us focused while creating a space where every voice was heard, every idea expressed. It seems that the group believes that last years efforts were worth while and should be continued. There will be another "Love Bombs" party October 9th at the 5-Spot. 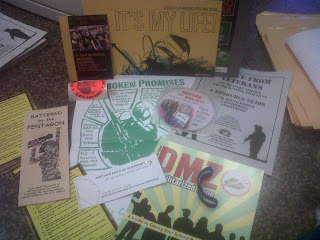 There will be another, "It's My Life" art contest in the spring of 2011. We will work with the ACLU and Georgia law makers to introduce a new Bill that would mandate a standardized Opt Out system, and we will continue to try to expand the number of metro Atlanta schools we have a presence at. There were a few areas of growth that were identified. Several folks expressed feeling like it somewhat difficult to navigate what SCAP is and how to get involved. Some suggested that this may be what's behind our capacity issues. It was suggested that we explore systematizing the process in which one becomes involved with SCAP and that we hold monthly trainings during the time that school starts on how to table at high schools, and how to provide career counseling. 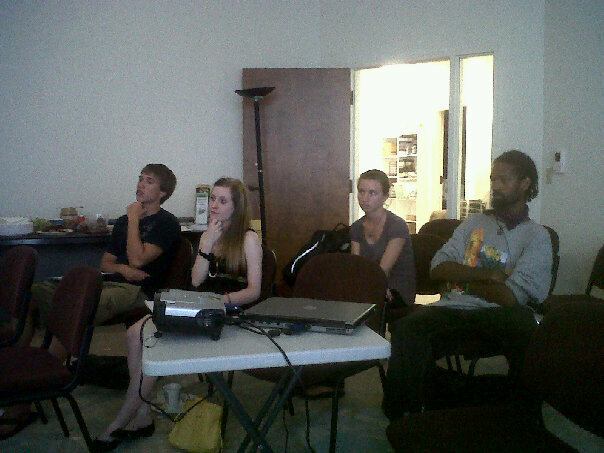 The group also wanted to have a stronger presence in the community, specifically youth venues and events. Below I've included a video of the notes that were taken by Christina for those interested. I think SCAP is a program to keep an eye on in the next 12 months, we're on the move and there's plenty of room for you to join us! SCAP is a project of the American Friends Service Committee and meets every Wednesday at the AFSC Atlanta headquarters at 60 walton street. The meeting are open. On Monday July 26 The Georgia Peace & Justice Coalition hosted a report back from the 2010 United States Social Forum which was held a month earlier in Detroit. This was no ordinary report back, instead of getting an academic analysis of the events in Detroit attendees were treated to more personal narratives from the young people who road to Detroit in the AFSC organized van. The reason Georgia Peace & Justice Coalition decided to have a report back in this format was two fold. 2. For those of us that went there was a general feeling that this year's USSF was much more youthful then the last, and perhaps more youthful then other national progressive mobilizations. We wanted to create a venue where young people could discuss how the experience effected them, and how they plan to apply the lessons of Detroit here in Atlanta. Erica Schoon, With American Friends Service Committee, played emcee for the evening and members of the Georgia Peace & Justice Coalition provided a pretty amazing dinner spread. It was an evening of tummy warming food and heart warming stories. "Be the Changers" to Re-Converge at GSPHE Summer Conference! Many of you will remember in May our report back from the 2nd annual “Be the Change” Youth Convergence in which we shared our excitement about this year’s chosen issue--public education. It’s time for an update on what the “Be the Changers” are up to now! As a recap: In 2009, the first convergence was held at Koinonia Farm near Americus, GA. The youth in attendance participated in workshops and discussions and ultimately decided to focus their combined statewide efforts on "truth in recruitment" issues over the next year. The original group, along with many who joined their forces, achieved a number of de-militarization successes in GA.
Young people, particularly those at the K-12 level, have the right to a quality education. Students are not ATMs. We didn't cause this crisis, and we shouldn't have to pay for it. While we are in the process of pursuing statewide solutions, we cannot forget to lend a hand in our local communities through mentoring, tutoring, supporting teachers, etc. Over the summer, individuals have been pondering these five points, researching, and spreading the word to their friends. The four committees have been meeting via conference calls to brainstorm, set goals, and decide what form their projects will take. The entire group of "Be the Changers" (including more and more who have jumped on board the committees via word of mouth since May) have been deciding how to best address the urgent need for change in Georgia's current education crisis. Finally, it's time to get back together, introduce all the new faces, report back on what the four committees have been working on, and collaborate with those already working on education in Georgia. The FREE Summer Conference being hosted by the Georgia Students for Public Higher Education on August 7-8 in Atlanta is going to be a great opportunity to do that. The "Be the Change" group includes high- schoolers and is focusing on K-12 as well as higher ed, but we have a lot of overlap with the higher ed movement and can benefit hugely from combining our efforts in that department. For that reason, we are proposing that everyone interested in the "Be the Change" Youth Education Campaign come to the summer conference to get plugged in. The GSPHE organizers of the Summer Conference are creating a space on Saturday the 7th during the conference for this “Be the Change” meet-up info-sharing session. During the session, we will have at least one member of each of the four committees present a brief summary of what the committee has worked on so far and what ideas are on the table for the year moving forward. We will talk about how we can work together with each other and other organizations and what we should prioritize as we move into the school year. The conference is going to be the best way to meet your fellow activists in person and the most FREE way for all of us to reunite since GSPHE is providing FREE registration, FREE housing, FREE food, and travel stipends!! The conference is open to students, educators, parents, and anyone else interested in education in Georgia. Although the conference is free, you still have to register. Click here to register and provide your info for the free food, housing, and travel. Kick off the school year right! Stay tuned for a report on the August 7th “re-convergence” session. To join the Youth Education Campaign’s email list or to join one of its committees, email me at erica.scap@gmail.com. See you in Atlanta! Peace Building in Augusta, Georgia!! Challenging the military industrial complex, and the culture of violence in our communities, has always felt like an uphill battle in the more conservative part of Georgia. Things have been especially difficult after the 2008 presidential election which caused many in the base of the peace movement to became somewhat complacent, assuming that the new President would usher in the age of peace...that didn't happen. Two years into the new regime and we're not only still in Iraq, the Military budget had increased by 4%, there's been an additional 30,000 troops sent to support an increasingly bloody occupation in Afghanistan, drones have kill hundreds of civilians in Pakistan, and the Israeli government continues to receive 10 million in military aid from us each day. The tremendous human and economic cost of war can also be seen in communities in Augusta. Poverty, foreclosures, unemployment, homelessness, and crime(especially amongst youth), is on the rise. It seems our countries addiction to war has broken the back of our economy and our communities. Building resistance to the systems that hold us down has never felt so urgent in my lifetime. That's why I was so excited when Central Savannah River Area(CSRA) Peace Alliance co-founder and Georgia Peace & Justice Coalition organizer Ayman Fadel asked if I would be willing to facilitate a day long peace retreat designed to re-energize and re-focus the CSRA Peace Alliance. Ive had the opportunity to do a lot of organizing work around rural Georgia over the years and I usually come with low expectations. I was expecting a lively group of 5-6 activist, likely all people that I had met before. When I showed up I was surprised to see around 20 people, many of whom I didn't recognize. Throughout the day there was a steady flow of new folks that joined us. After doing everyone was welcomed Denice Traina facilitated a brief ice breaking exercise that basically asked each of us who we would invite to our next birthday party if we could bring anyone from any time period. The answers were pretty fun. I went through a brief history of the peace movement in Georgia, 2002-present, and then Matt Powell presented on Pacifism, and Joey Traina gave the group an update on the "Peace on the Streets" campaign he's working on before we went into developing strategy and focus. We used a basic version of the dotmocracey model to prioritize issues that members of the alliance wanted to organize around. 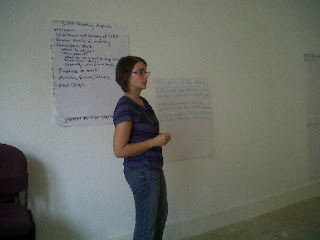 After lot's of discussion we finally narrowed our large list of issues into two basic projects. 1. 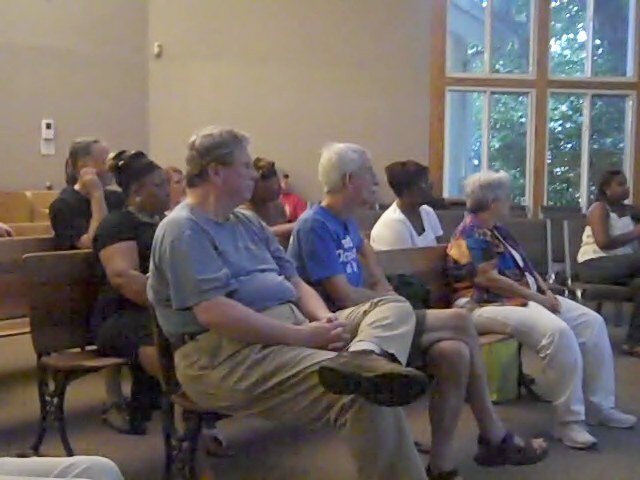 Developing the capacity to facilitate non-violence trainings in the Augusta community. One of the strong motivations for this idea seemed to be rooted in the fact that there has been a rise violence in Augusta and developing trainings may not only challenged the notion of violence in our foreign policy, but also in our own back yards. 2. Developing campaigns that challenge corporate rule. There where so many ideas connected to this project, I look forward to seeing what the working group comes up with. I would like to give a few very special thanks to Ayman Fadel for his overall commitment to the peace movement in Georgia, Denice Traina for putting me up Saturday night, and Fiona Sheehan for helping me facilitate and taking all the beautiful pictures! 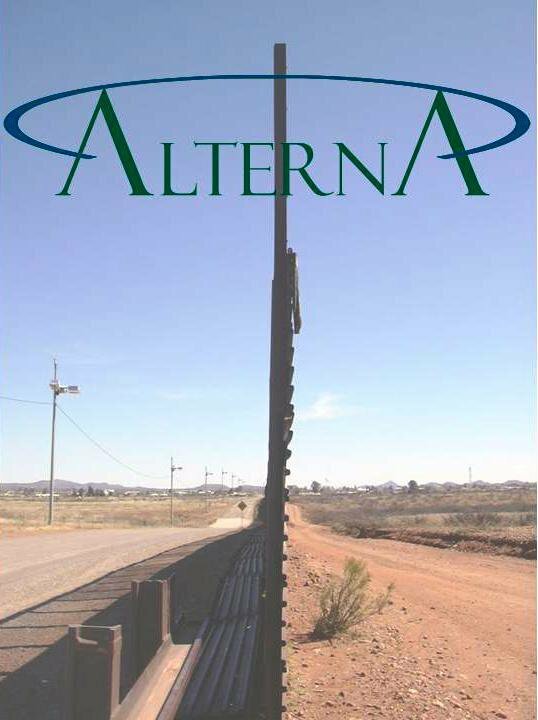 While I was in LaGrange for a Truth In Recruitment strategy session(which was sponsored by Alterna) I wanted to go ahead and check out Alterna, the organization that Anton Flore's helped to start. I must say, I was impressed. Alterna not only facilitates regular tours to Guatemala, they provide detention and prison ministry, court advocacy and monitoring, health outreach in the Latino community, legislative and policy advocacy, and school based services, they provide an extremely tangible service, cooperative housing! Alterna basically owns five houses on the same street in LaGrange, and they rent additional space for interns. Latino immigrant families earn equity while paying a sub-market “rent” in dependable homes. They share meals, participate in community events, and share a community garden. Check out Anton Explain what Alterna is and how you can support. Adam Barnett came to the last two “Be The Change” Youth Convergences hosted by the American Friends Service Committee and the Georgia Peace & Justice Coalition. In the last few years we’ve all watched Adam develop a passion for working to develop a more just community. Adam was particularly inspired by Oskar Castro’s(AFSC National Youth & Militarism Staff) workshop on youth and militarism at this year’s “Be The Change”. 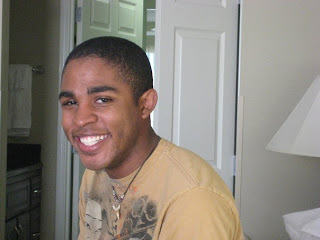 Adam decided that it’s time to organize folks in La Grange Georgia to challenge the militarization of youth culture and the recruitment of his peers into the military. Adam worked with local activist, and founder of Alterna Community, Anton Flores to host an initial strategy session to explore first steps for build a Truth in Military Recruitment movement that would not only provide young people with information about the realities of military service and benefits, but also provide young people with realistic non-military post high school options. One concern that was articulated in our session was that military recruiters have all the access they want o high school campuses and they come across as career counselors, people that are there to help pave the way to a brighter future. This is particularly disturbing when one looks at the statistical realities of modern veterans. Modern vets have an extremely high suicide rate, they earn 15% less then non-veteran counterparts, 1/3 of female veterans report sexual assault while on duty, less then 12% of veterans find that their military experience translates into a civilian job,1/3 of homeless people are veterans, and coverage for PTSD is being denied left and right. At one point Adam expressed feeling frustrated that more people from his community didn’t show up for our session, I was of course not that surprised , as I’ve seen/experienced how hard it can be to organize conservative strongholds like La Grange. Interestingly, as I was on my way back to Atlanta I decided to stop for a coffee to go. S I ordered my coffee I recognized another Be The Changer. Him and his co-worker both said that they had wanted to come to Adam’s session but were unable to due to work. I was able to take a moment to give each of them an organizing packet that was given out at the meeting and summarize what we had covered, small world!